A phoenix rose after Black Saturday 2009. 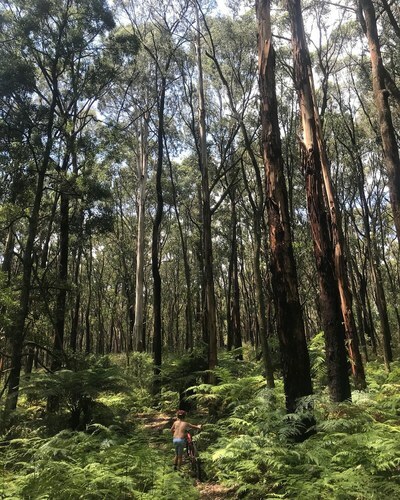 Kinglake Forest Adventures (KFA) was reborn. It's former camp, replaced by an up-to-the-minute and exciting facility. A school camp by week day and a playground of adventure for the public by weekend. Kinglake is a 60min drive north-east of Melbourne CBD and host to a rejuvenated forest. We were welcomed by Owner Colin as we entered the nature oasis and then introduced personally to the KFA team. A stunning natural backdrop awaited us and a bright, modern set up of repurposed containers as café, bike storage and harness station. 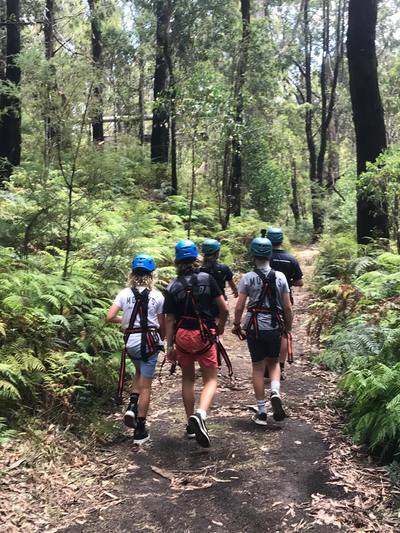 My group of 5 (aged between 9-39) were harnessed up for the Treetop Challenges, along with another family of 4 of similar ages. 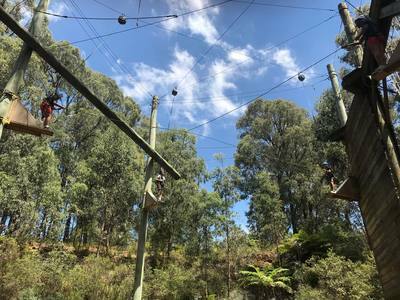 Two hours of Treetop Challenges, accompanied by up to four friendly and energetic KFA staff, included a treetop swinging boardwalk, followed by a steep Flying Fox zip line, high up amongst the wild birds, freefall jumps from wooden platforms and many tree and ladder climb challenges. Each challenge was awarded by a bell ring or squeaky toy squeeze at the top of the challenge, something which was met by applause by all. The world first "Centre Fall" was a favourite amongst the more daring of our crew. An 8m high, four-way tug of war. After a quick pole climb, the four competitors stand precariously on their own platform, as long and as wide as their feet, and compete to be the last man standing. An awakening experience, I am told! Four-way Tug of War, 8m high! After our two hour Treetop Challenge we feasted on a much needed and well earnt lunch in the cafeteria area. The Café is open during business hours and offers an array of hot and cold food options as well as many hot and cold beverages. Up next was Mountain Biking. Our team of 5 were measured up with appropriate sized mountain bikes and helmets by the ever helpful "Slim". We opted for a range of mountain bikes and turbo Levo bikes. (Oh my! The Levo bike was something out of this world in terms of biking. I'd highly recommend hiring for anyone on the spectrum of inexperienced to highly experienced mountain bike riders. Levo - an innovative e-mountain bike with extra oomph and electric speed!) All bikes come with drink holders, which came very much in handy on a 30 plus degree Melbourne day. Slim gave us a quick lesson on mountain bike riding and the lowdown on the different tracks at KFA, ranging from beginner to intermediate. We decided to tackle the hardest and longest 5k "moon" trail. The moon trail wraps its way around the forest on narrow paths amongst the ample wildlife that Kinglake is home to. With its hill climbs, long downhill runs, bridges, steep curves and sharp turns, it didn't fail to impress. However, I'd suggest tackling some of the beginner tracks first if you are venturing out with those under the age of 12. The moon trail wrapped up four hours of adventure and fun at KFA. We said our farewells to the amazing staff who went above and beyond for our whole experience, knowing us each by name and capability by the end of the day. 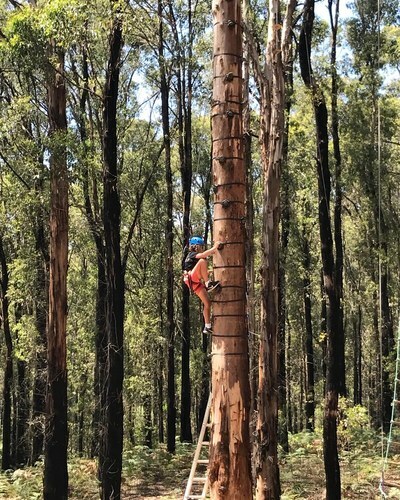 I'd highly recommend Kinglake Forest Adventure Treetop Challenges to those with children aged 10 plus . If you have children who are scared of heights or under the age of 10, I'd give the Mountain Biking a red hot go! The perfect place for a tween's party, depending on the distance you are willing to travel. KFA's attention to detail and care for its participants did not fail to impress. It was a day filled with memories that my lot are sure to remember for a life time! 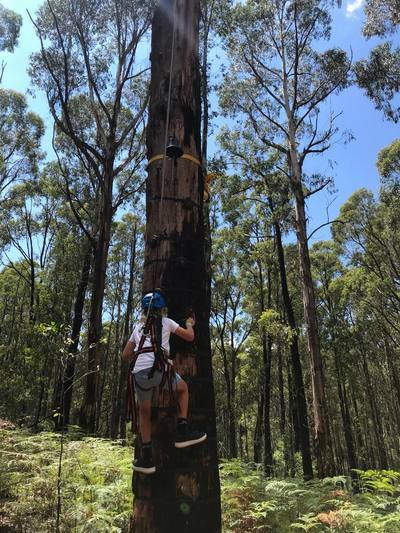 Thank you to Guest Reviewer Jessi and her family for road testing the amazing Kinglake Forest Adventures and for 11yo Zac's fab GoPro video! When: Open every weekend, school holiday and public holiday (except XMAS day). 10am for walking, discovery centre, outdoor rec arena. First bike and treetops sessions at 11am. Treetops and Bike sessions go for two hours. Arrive 30min prior to your start time so you are ready to go with helmets etc fitted.